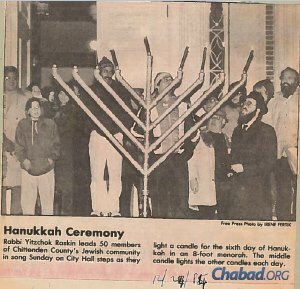 While large Public Chabad-Lubavitch Chanukah Menorahs are very much a part of the fabric of American life today, gaining permission to display the menorahs on public property was not without hurdles. Indeed, almost from the inception of the public menorah by enterprising Chabad-Lubavitch emissaries, opponents of the effort brought their grievances to the courthouse, claiming the menorahs violated the separation of church and state. Defenders countered that the public display was protected as a matter of freedom of speech and freedom to practice one’s religion. Chabad.org’s Margolin’s research unearthed some additional interesting facts about Sanders and his Judaism which have not yet been reported. We share that, too, below. Below is the information more-or-less in chronological form, along with some interview notes and additional explanatory information. With its small Jewish population, Vermont is historically not used to much public Jewish expression. In December of 1982 the Burlington Free Press ran an opinion piece titled: Attempting to Celebrate Hanukkah Always Seems Difficult in Vermont. The Sanders administration welcomed these requests, and granted full permission. 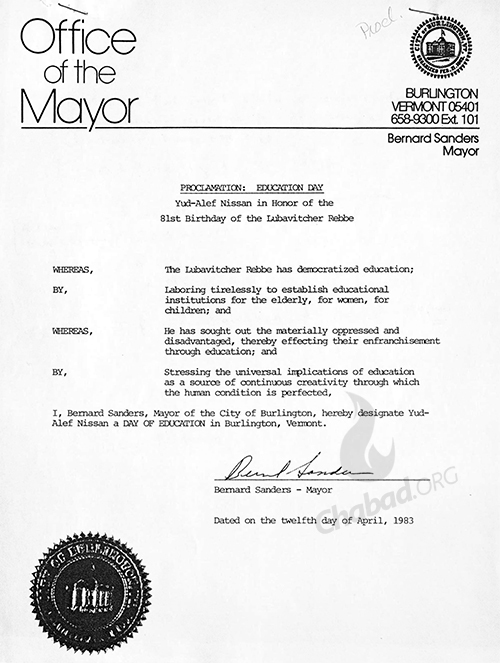 Governor Madeleine Kunin actually disagreed with Mayor Sanders about the menorah’s permissibility but despite her disagreement, and the vociferous opposition of many of Sanders’ friends and political supporters, the mayor and his administration were steadfast in their determination to allow the religious expression in the public sphere. It is difficult to overstate how closely allied the ACLU and Bernie Sanders were on the vast majority of social issues. Yet when activists—with the assistance of the ACLU—finally did file suit against the city in June of 1988, Sanders and his administration chose to vigorously defend their position in court. “Come on Mayor Sanders, let’s drop the idea of any religious symbol being displayed on any government property. The whole idea is an extraordinary waste waste [sic] of taxpayers money. Or are you billing Lubavitch of Vermont for legal fees? 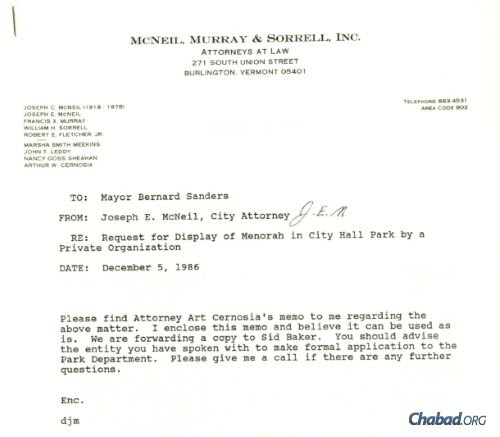 A 1988 letter from Reverend Paul Bortz condemning Sanders for his efforts in the menorah case. Credit: 21/30, Bernard Sanders Papers, Special Collections, University of Vermont Library. 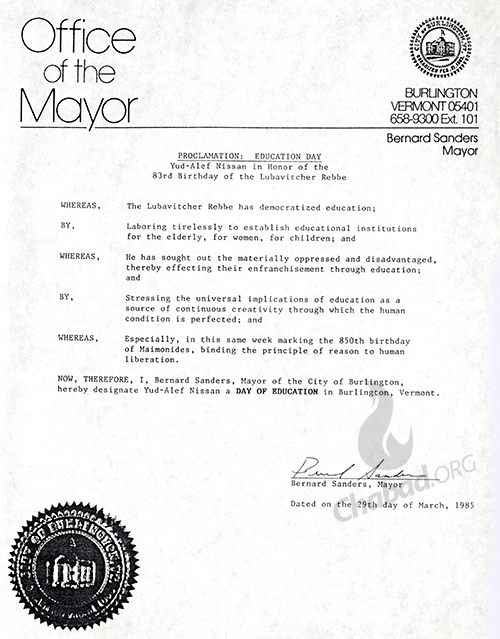 On Dec. 8, 1988, just before Chanukah, U.S. District Judge Franklin S. Billings Jr. issued a particularly strong ruling in support of the Burlington menorah, a story closely reported by The Times (and distributed around the country by its now-defunct wire service), and many other national outlets. 2. How Did Bernie Sanders Celebrate His Reelection as Mayor? Sanders was first elected mayor by ten votes, and his shocked opponents in both political parties (Sanders was an independent until recently) said his election was a fluke and that he was a one-term mayor. However, Sanders won reelection in 1983, and then again in 1985, each time by growing margins. Professor Sugarman (see above) helped Sanders celebrate his 1985 reelection by bringing him to Chabad’s Purim party two days after the election, where he joined in the celebration of the miracle. With the newly widespread use of cable and satellite television in the 1980s, some of the Lubavitcher Rebbe [Rabbi Menachem M.Schneerson, of righteous memory]’s farbrengens (public gatherings) were broadcast live via satellite by the newly-formed Jewish Educational Media (JEM). During his farbrengens the Rebbe would teach Torah to thousands of for many hours on end, and often expound on the Torah’s universal lessons for society at large and its bearing on contemporary world events. JEM’s broadcast of the farbrengens brought the Rebbe’s teachings, along with his unique delivery and style, to millions of people nationwide. A) The unusual citation of the Hebrew date of the Rebbe’s birthday as “Yud-Alef Nissan,” which is the Hebrew for the 11th of month of Nissan. 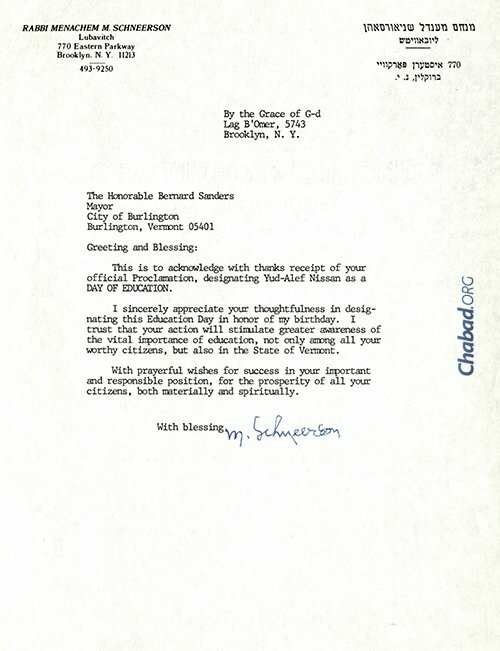 B) The uniquely "Sander-esque" language and style he uses in honoring the Rebbe. To Brian Westley and Gersh the Mench The supreme Court ruled twice on Pittsburgh's menorah in two separate cases. First was that the city was allowed (through Chabad) to put it up because it wasn't intrinsically religious (it is religious, but not holy like a Torah) so it didn't violate separation of church and state. Misleading article This article does not mention that Bernie Sanders is an atheist who hates the constitution. 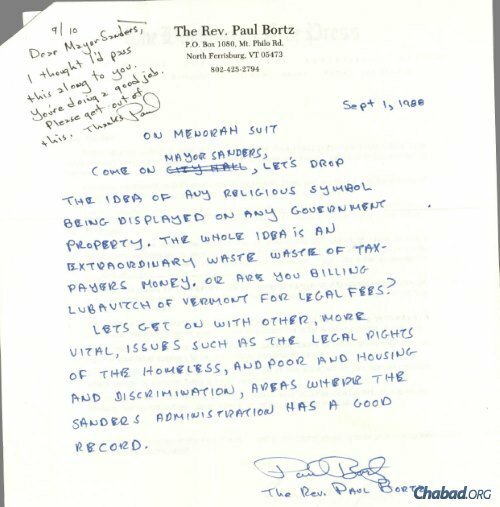 The caption is a bit misleading You captioned one of the picutres "A 1988 letter from Reverend Paul Bortz condemning Sanders for his efforts in the menorah case."